Germany Euro 2016 Kit | New Home, Away Jersey: The world champions Germany Football team will feature in the new Adidas Germany in the Euro 2016 tournament. The giant German manufacturer Adidas introducing the Germany home and away shirts with new positioning for the Adidas iconic 3 stripes. 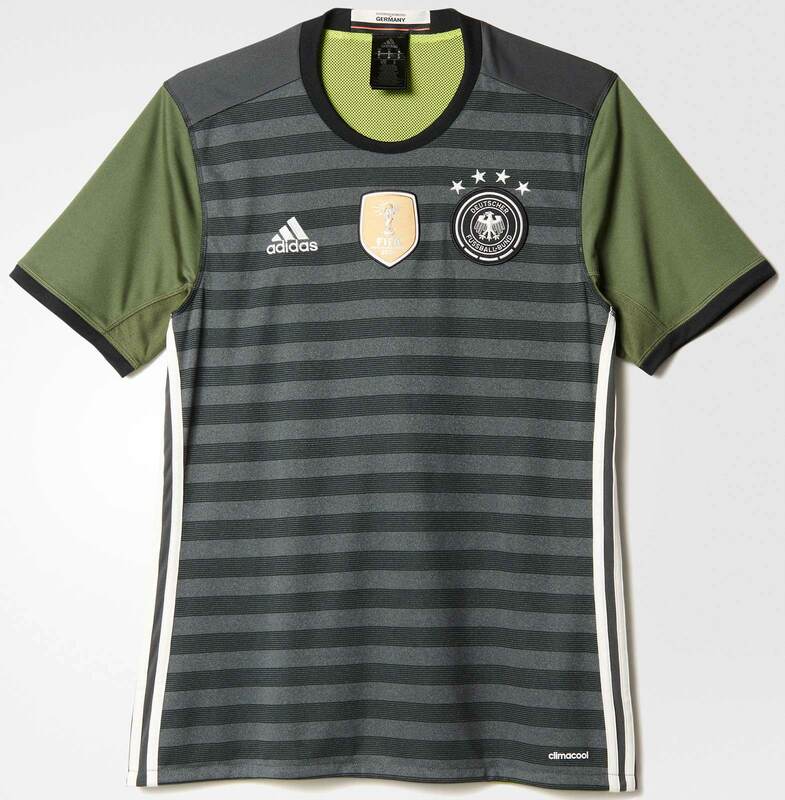 Here is the Germany modern kit for the Euro Cup 2016 championship. The new Adidas Germany Euro 2016 home kit was released during the friendly match against France in November 2016. The Germany Euro 2016 home shirt features the traditional white color with a simple back round neck collar and German flag in a panel at the back. 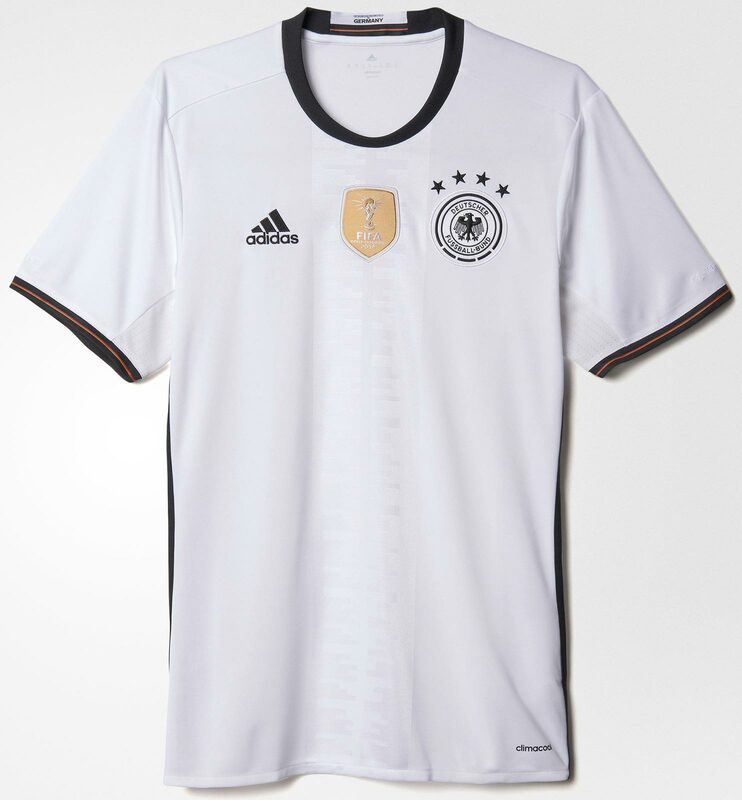 The Germany home 2016 shirt front side features the Adidas logo in the right while the gold FIFa World Cup winners badge in the center and Germany football club logo in the left side of the chest. Adidas has changed the position of its iconic 3 stripes in the Germany Euro 2016 jersey which are placed on the side of the sleeves. Black shorts and socks completes the Germany Euro 2016 home kit. The black shorts and socks combination was last used at the 1962 World Cup and once again Adidas bring back the this classic combination in the Euro Cup 2016. The new Adidas Germany 2016 Euro away jersey introduces with a new reversible design. The kit color is in dark gray with subtle back woven hoops combined with green sleeves which is inspired from street football. The away jersey can be reversed to boast the striking color neon green which is designed to be used as a bib. “Bolzen. Kicken. Pohlen” is placed on the back of the collar of the kit. The off white shorts and and off white / dark green socks complete the new Adidas away kit of Germany. What do you think of the Germany new home and away jersey for the Euro 2016? Let us know with commenting in the given below comment box.